All the puzzles are reasonable. They don't require you to do anything random; they don't require guessing. They don't require trial and error. The solutions tend to be simple and natural. They flow directly from the rules of gameplay in each world. 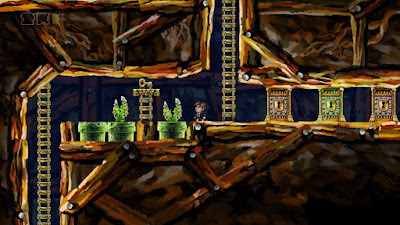 While I agree that the puzzles are reasonable and that they flow directly from the rules of the gameplay world, I doubt there is anyone aside from Jonathan Blow who has completed Braid without a fair share of guesswork, trial and error, and a willingness to explore complicated and unnatural concepts. I present this not as a criticism, but as a compliment. Had Braid's puzzles not required experimentation and exceptional thinking, the game would have been a significantly more mundane experience. Braid allows me to indulge in what I have referred to previously as "scientific gaming." My favorite (and I would argue the best) games tend to focus on pushing the player to explore a core system of rules: Mario has jumping and dodging, PixelJunk Eden has jumping and swinging, and Portal has jumping and...portals. Evidently, I have a clear pro-jumping bias. Certainly, the aforementioned examples are crude over-simplifications, and their rules reflect neither reality nor necessarily rules that the player would choose for themselves. Their strength flows not from affording player agency in terms of creating rules, but in giving the player a solid foundation on which to build their understanding of the in-game universe and the power to then experiment with these constraints. Braid, like the aforementioned examples, partakes in the hallowed tradition of jumping and pairs it with time manipulation. The game combines these and other actions to give rise to mind-bending dynamics, but the center of the game revolves around immutable underlying rules that govern the way time flows and Tim moves. Contrary to the walkthrough's assertion, the game is about guessing, trail and error, and exploring what would seem unnatural in most games. Jumping off the ledge in "Leap of Faith" to get the puzzle piece almost guarantees failure the first time. The solution requires learning from your mistakes and evaluating hypotheses on how to reach that piece. Solving Braid's puzzles is about more than simply obtaining a reward or overcoming an obstacle; the solution necessitates that the player ends up with a greater understanding of the game's most basic systems with every additional piece. I seriously doubt anyone could solve this puzzle so flawlessly the first time they encounter it. Personally, it probably took me more than an hour of experimentation before I realized the solution. Initially, I kept bouncing off goombas to get the trampoline effect, trying in vain to will myself up the platform. I tried luring two enemies out of the cannon to increase my jump, but that didn't work either. 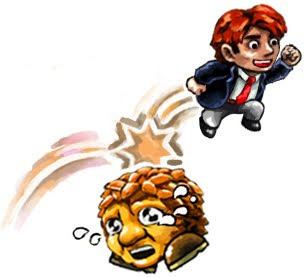 My breakthrough started on a fluke: I accidentally allowed the goomba to drop on me from above. Since one of the rules of the universe was that death is reversible, I let the full animation play out rather than rewinding it after the immediate hit. To my surprise, I saw the goomba trampoline off of me as, just as I did off of an enemy. I then put it all together: I already knew that the shadow figure acted as physical being, therefore the goomba would bounce off of it, and then I could then bounce off of the goomba and into victory. This breakthrough is a glorious contradiction of the official walkthrough. Solving the puzzle came after much trial and error. The epiphany of realizing the enemies could bounce on me came randomly, from my mistake. The decision to sit through the entire death animation was one made out of curiosity. Combining these elements yielded an unexpected, yet extremely logical and satisfying solution, as the outcome was perfectly justified by the game's core rules. So often, "puzzles" in games are actually glorified checklists. Figuring out how to defeat a boss in a Zelda game is often as simple as seeing a pattern and finding the flashing red part of the enemy's body. In the recent Resident Evil 5 DLC, the first twenty minutes consist of puzzles that are little more than speed bumps: there is no creativity or experimentation necessary to solve them and they are just there to play off of nostalgia and extend the experience. Done correctly, a puzzle is something that requires a scientific thought-process. Exploration backed by solid, consistent mechanics allows the player to utilize the game rules rather than simply be propelled forward by them. I agree with the spirit of Braid's walkthrough: it is intensely rewarding to both solve the puzzles and to see how the solutions are justified by the game's basic structure. I would go further and contradict the guide to argue that it is not in spite, but because of the game's ability to accommodate experimentation and chance that the puzzles are so successful. Braid gives us a world in which valid solutions can arise from hours of incremental tests, a seemingly random fluke, or a combination of the two. Scientific logic and serendipity are not mutually exclusive. Just ask Alexander Fleming. Great article. I think you are both right. Braid is good because you have to experiment and use some trial and error to figure out what the time-bending laws are for each new world. At the same time, once you understand those laws, you can usually figure out the solution through deduction. I'd never thought about it too much before, but it is a very scientific process. You observe phenomena, you experiment under different circumstances, through a process induction you begin to extrapolate theories about the rules of the game universe, then through a process of deduction you can use your knowledge of those laws to solve the puzzles. It's rather brilliant that this process can happen all in game. The fact that Braid is also a 2-D platform game also helps breath life into these logic problems so the game is intellectually challenging without ever feeling stale. Hey JT! Thanks for stopping by, as always. In general, I think experimentation and trial and error get a bad rap. One of the great things that sets games apart from other media is their capacity to allow for exploration. I think a lot of the tension found in games comes from trying to apply a linear story to cyclical experience.